Who and when are two of the most basic questions in archaeology. The question of who is generally understood in Newfoundland and Labrador. The question of when is often answered with radiocarbon dating, particularly for precontact cultures. I am not going to get into how radiocarbon dating works nor am I going to get into the limitations of radiocarbon dating. A quick Google search will give you more than enough information on both of those topics. The culture history of the Province’s past is fairly well understood as are the generally accepted date ranges for those cultures. Most archaeologists in the province could easily and quickly tell you the date ranges for any culture. But many would be challenged when asked where those earliest and latest dates were found or what site they came from. This week I decided I’d take a look through the archaeology database of sites and point out where those earliest and latest dates were found and what site they came from. This isn’t meant to be the definitive list on site dates, things are changing all the time, it’s just the list I have in front of me right now. The table above shows the generally accepted sequence of cultures in Newfoundland and Labrador’s precontact past. Within each of these major groupings there are other recognized groups that are temporal or geographic expressions of the overall group. I’m not going to break down the dates by the smaller groupings. Also, there is some temporal overlap between many of these groups. For example, there were Palaeoeskimo groups around when the Recent Indians were here. So the different cells in the table don’t mean the cultures are separate and didn’t co-exist. The table just follows the broad temporal pattern of oldest on top and youngest on bottom. Also, while we use names such as MAI and PE for the overall group we are not stating that within these groups there is a clear transition from the first to the last (i.e. earliest MAI is a direct ancestor of the last MAI). There is evidence in the archaeological record of different waves of people moving into and out of the Province during these time periods; the names are used to denote that they had similar cultural characteristics and we therefore classify them under the overall group name. One more note, the terms Earliest Settlers and First Explorers have been used variously to refer to the first people in Labrador more than nearly 9000 years ago. As far as I understand these groups have never really been named, so for simplicity’s sake I am just going to lump them under the Maritime Archaic. We need to be aware that the Earliest Settlers are Palaeo-Indian descendants and the Maritime Archaic was likely their descendants. Also, when I learned this sequence as a student the only archaic Indians inLabrador were the Maritime Archaic. Recently the idea of the Labrador Archaic has been introduced; I’m not sure how widely this term is accepted. I haven’t seen it used a lot so I am just going to use the term Maritime Archaic. In Labrador the earliest date for the MAI (including Earliest Settlers and First Explorers) comes from the southern Labrador community of Pinware at the site of Pinware Hill. It is assumed that Pinware Hill is the same site that was first found by Elmer Harp in 1949 and later found by Jim Tuck and Bob McGhee in 1973. In their excavation they located enough charcoal for several dates the oldest of which was 8850 ± 100 (SI-2309). There is a similar date at the Cowpath site in nearby West St. Modeste of 8600±325 (SI-2606). Like Pinware Hill it is though that this site was first found by Harp in 1949 and retested by Tuck and McGhee in 1973 at which time they recovered charcoal for the date. The youngest date for the Labrador MAI is 3025 ± 135 (SI-1284) and is from a site called Monument Point 3 found by William Fitzhugh in 1972. The date was based on charcoal from a hearth and the site also included more than 300 artifacts and habitation structures. The earliest Intermediate Indian date in Labrador that I could find was 3500 ± 70 (SI-2438) which came from Black Rock Brook. The site only has an II occupation and was found by Tuck and McGhee in 1975. The date was based on charcoal from a hearth found at the site. From the central Labrador coast another site called Hillsbury Island East 3 has a date of 3440±75 (SI-2982) based on wood charcoal. This site also has just one cultural occupation, II, and it was found by William Fitzhugh in 1976. In the same general area the Saunders Site has a date of 3410±70 (SI-2525). This site may have been found as early as 1927 or 1928 by William Duncan Strong but the date is based on wood charcoal found by Fitzhugh in 1975. For a variety of reasons it is not clear what the last date is for II in Labrador. For example, the latest date I could find associated with an II site seems to be 885±110 (SI-1288) from the Sid Blake site which was found by Fitzhugh in 1968. However, it is thought that it may actually date a widespread forest fire. There is another date of 935±120 (SI-1286) from Paul Michelin site but this date is also thought to represent a forest fire. The next dates that firmly date II occupations come from Ticoralak 7 and Shinapeu ushipisim 1. At Ticoralak 7 a single II component is dated to 1850±60 (Beta-22401) while at Shinapeu ushipisim 1 a single II component is dated to 1910 +/-40 (BETA 255664). Ticoralak 7 was found by Fitzhugh in 1968 and the date is based on charcoal from a hearth. Shinapeu ushipisim 1 was found in 2000 by Stephen Loring and the date is also based on wood charcoal from a hearth. 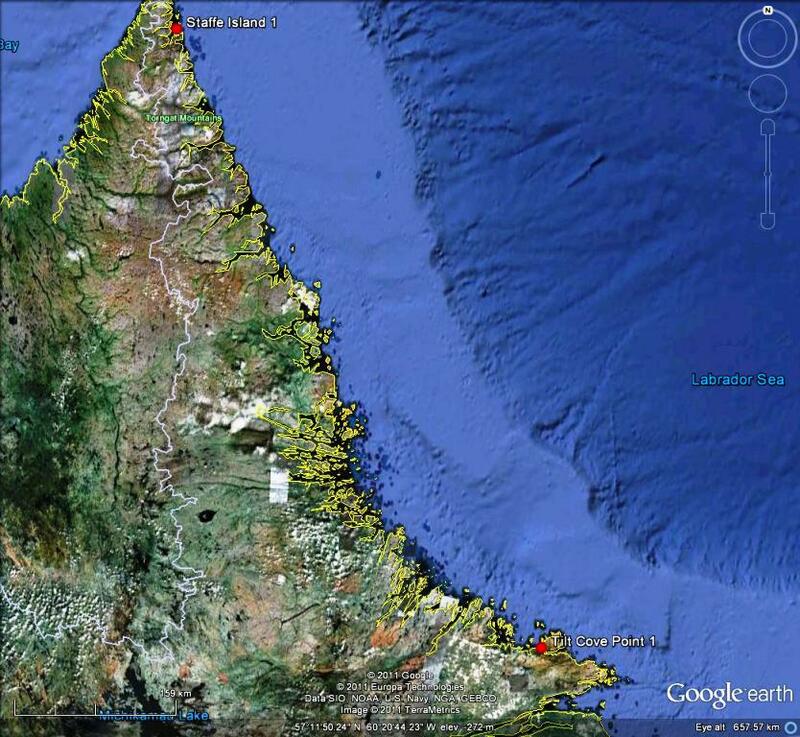 Palaeoeskimo groups first show up in northern Labrador around 4000 years ago. The site of Nuasornak 2 has a date of 4250+/-90 BP (Beta 25200) based on material from a Pre-Dorset structure. However Steven Cox, who excavated the site, believes the date is too early for the terrace elevation on which the site is found and for the typological characteristics of the collection from the structure. Nuasornak 2, found by Fitzhugh in 1984, is a large PE habitation site with nearly 40 recorded tent rings. 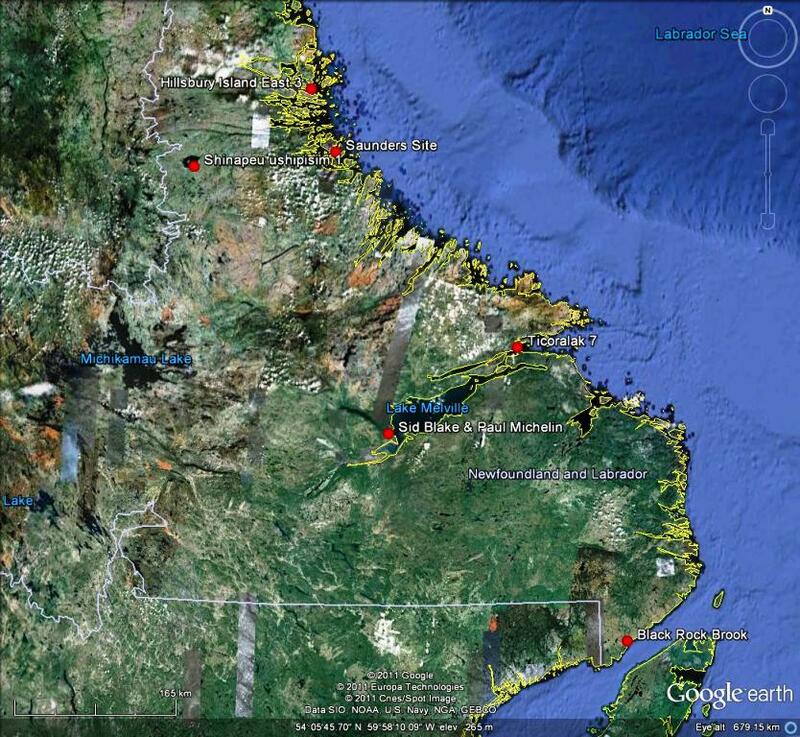 There are two other PE sites that also have very early occupations in northern Labrador. Little Ramah Bay 1, found by Fitzhugh in 1977, has a date of 4055±80 (SI-4002) and Brownell Point, found by Fitzhugh in 1978, has a date of 4060±250 (Beta-11000). So perhaps, depending on the ±, the date from Nuasornak 2 may be accurate? 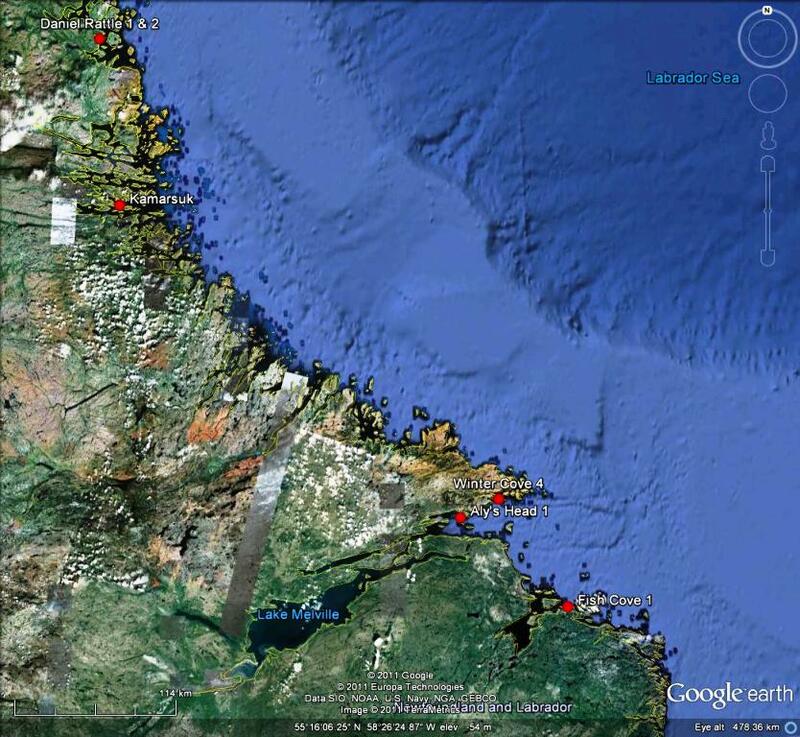 Either way the earliest dates for PE in Labrador are around 4000 years ago. 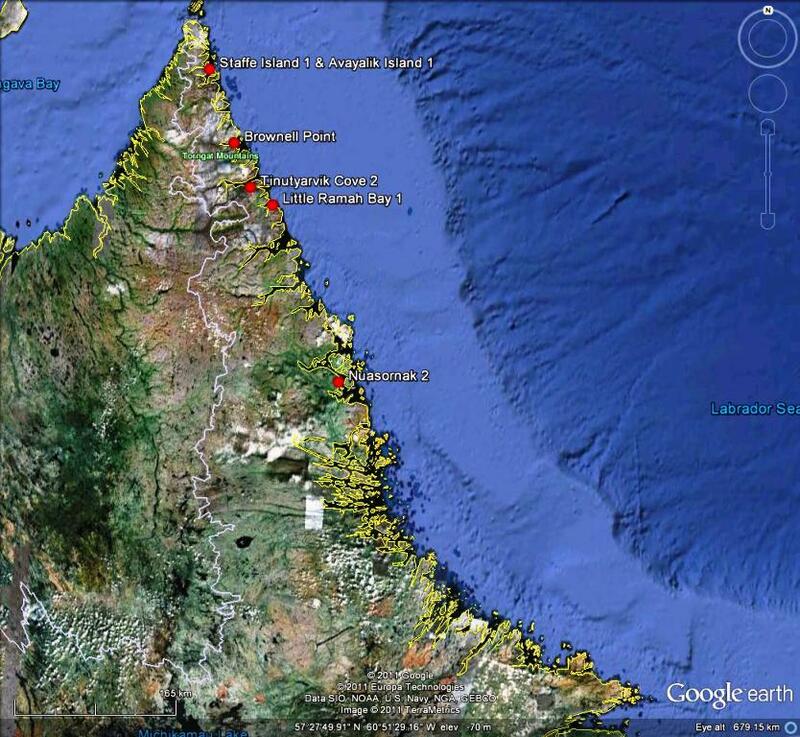 The latest date for Labrador PE comes from Tinutyarvik Cove 2, a site found by Fitzhugh in 1977. The site has 3-4 house depressions and a single Late Dorset component which was dated to 665±95 (SI-3375) using a piece of birch wood. Very close in time is Staffe Island 1, found by Patrick Plumet in 1967, and Avayalik Island 1, found by Fitzhugh in 1977. The Staffe Island 1 date is 670 ± 130 (Beta-40406) and was run on conifer charcoal. 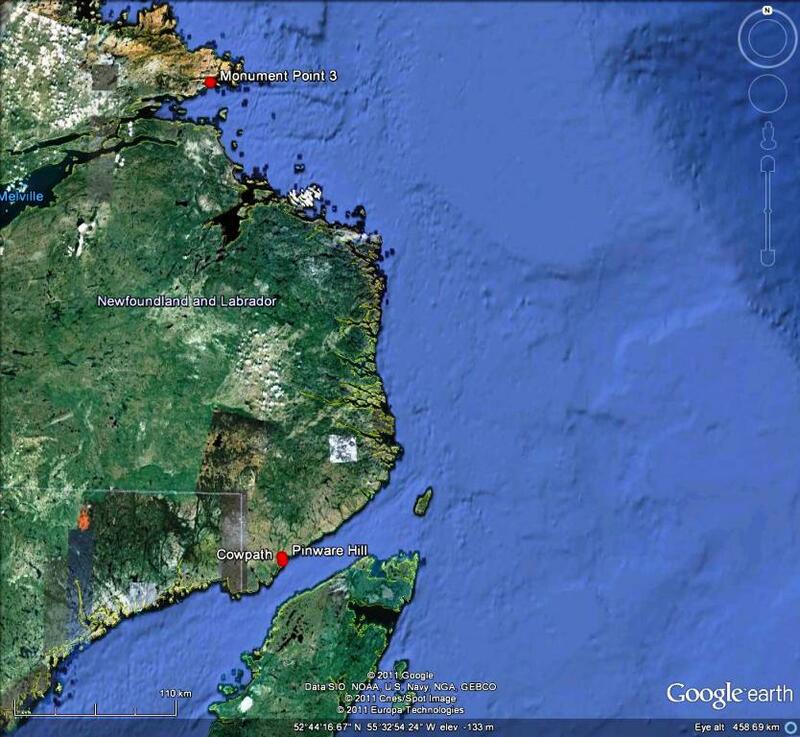 The Avayalik Island 1 date is 670 ± 60 (SI-3864) and was run on coniferous roof timber from a Late Dorset house. I mention the Staffe Island date but it should be taken with some caution as it is a multi-cultural site and includes a Thule occupation. The Thule, for some reason, had a habit of creating their sites on top of Late Dorset sites throughout the Arctic. There is a long standing debate in Arctic archaeology about whether the Late Dorset and Thule temporally overlapped and therefore can we really trust Late Dorset dates from sites with Thule occupations. The date for the first of the Recent Indians in Labrador comes from the site Daniel Rattle 1 which was found in 1982 by Loring. The date, 1890±50 (SI-6712), was based on charcoal from a hearth that was thought to be inside a structure. This is the only date for the RI in this time range; the next oldest dates are in the range of 1500-1600 years ago. There is a date of 1670±80 (SI-6716) from a hearth in a structure at Kamarsuk which was found by Fitzhugh in 1973. There is also a date of 1580±90 (Beta-56251) from Fish Cove 1, a site found by Marianne Stopp in 1992. Finally there is a date of 1500±120 (SI-6714) which also comes from Daniel Rattle 1 and is based on charcoal from the same hearth that was dated to 1890±50. The last date for the RI in Labrador, like the last date for the II, is unclear. There are a series of dates from several sites that point to the RI in Labrador lasting right up to and just into the period when Europeans make prolonged contact with this area of North America. For example at Winter Cove 4, found by Fitzhugh in 1969, there are dates of 465±45 (SI-1281) and 435±90 (SI-1282) based on charcoal from hearths. At Daniel Rattle 2, found in 1982 by Loring, there is a date of 425±65 (SI-5829) based on charcoal found in a bone concentration. Finally, at Aly’s Head 1 charcoal from a hearth was dated to 325 ± 80 (SI-1276). This site was found by Fitzhugh in 1972. It is often accepted that the last of the Recent Indians in Labrador become the Innu of Labrador today although there may be a temporal gap between the last of the RI in Labrador and the oldest recognized Innu site in Labrador of 100 to 200 years. Also, unlike on the island where there are clear transitional sites showing the last of the Recent Indians becoming the culture recognized as the Beothuk, no such transitional sites have been recognized in Labrador’s archaeological record. This is obviously an area which requires further research. Before discussing the Thule I will remind the reader of my previous comments on how the Thule had a habit of creating their sites on top of Late Dorset sites and of the debate in Arctic archaeology about whether the Late Dorset and Thule temporally overlapped and therefore can we really trust dates from those sites. In the case of the Thule in Labrador there is a date of 735±55 (SI-6699) from Tilt Cove Point 1, a site with just a Thule occupation. I have no information on how the date was derived. There are also several dates from Staffe Island 1 including 870 ± 70 (Beta-33047) (based on conifer charcoal), 740 ± 50 (Beta-33046) (based on conifer charcoal), 675 ± 70 (SI-3891) (based on conifer wood) and 630 ± 60 (Beta-33045) (based on wood). But all of these dates should be taken with some caution as it is a multi-cultural site and includes a Late Dorset occupation that may have temporally overlapped the Thule. Whatever the first date of Thule arrival was, it is known for certain that the people of the Thule culture become the Inuit of Labrador today. In my next post I’ll go through the earliest and latest dates for the precontact cultures of Newfoundland. Cox, Steven 2003 Palaeoeskimo Structures in the Okak region of Labrador. Études/Inuit/Studies, 27(1-2):417-433.